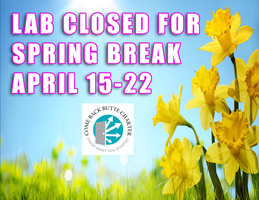 Come Back Butte Charter will be closed for Spring Break 4/15-4/22! That includes Monday 4/22! Students will return for appointments beginning Tuesday, April 23rd.Edgenuity will be up and running so you can continue to move forward with your school work! Have a great week! Join us for an Italian Food Feast! Join us Friday March 29th, noon to one for an Italian food feast with pasta, salad, drinks and raffle prizes for students! Friends and family welcome! 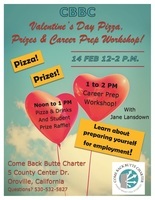 Valentine's Day Pizza Party, Raffle & Career Prep Workshop! 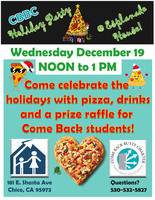 Join us for free pizza, drinks, a student PBIS prize raffle Noon to 1 PMAnd then 1 to 2 PM We will have Jane Lansdown teaching a free Career Prep Workshop!We hope to see you there! Hey staff and students! 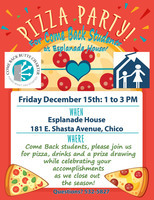 Come on over to the Esplanade House in Chico for our annual E-House Holiday Pizza Party!Pizza, dessert and drinks will be provided and there will be prizes for students to win in the raffle! Friends and family welcome!Hope to see you there! Autumn Writing Lab! Friday Nov. 16th! 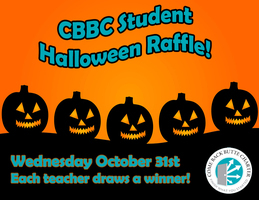 Halloween Raffle for CBBC Students! 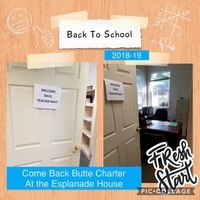 The Esplanade House is ready for back to school 2018-19! Clients, who do not have a high school diploma, enroll with Come Back and work to finish what they started! Matt McGuire, Come Back teacher, returned for the new year with an office and a warm welcome! It's going to be a good year! 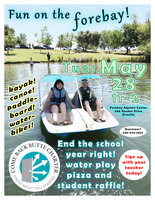 Come join us for fun on the forebay! 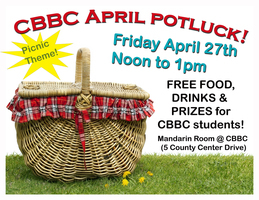 This is our monthly potluck but we're taking it outside to the nearby forebay aquatic center! Pizza and ice cold water provided. Bring sunscreen and a towel! We also have great prizes for students to win in the raffle! Come to our monthly lunch! 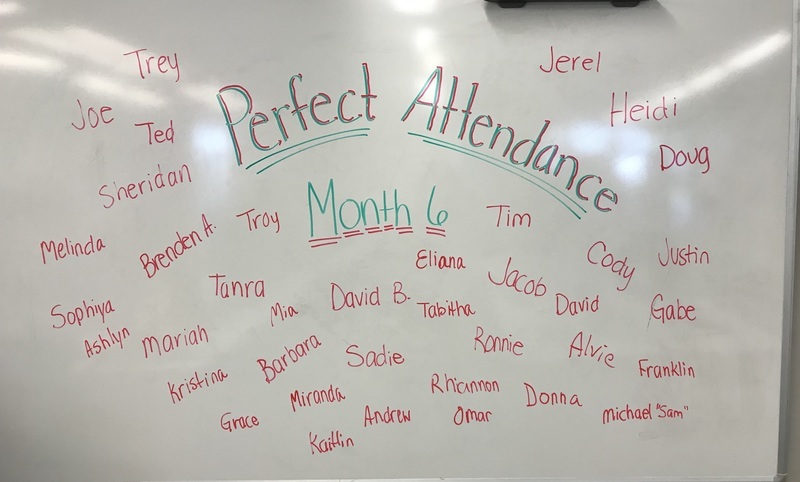 Forty Come Back students had perfect attendance during month 6 (Jan. 1-29, 2018). Way to go students! 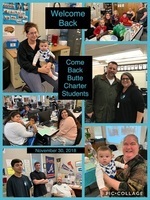 Come on down February 23rd, noon to one for free food, drinks and prizes!Come Back Butte Charter has a potluck every 3rd Friday of the month. 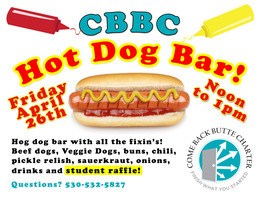 Students, faculty and family get together over great food and get to know one another.We also offer prizes for students who earn PBIS tickets for staying on track, staying positive and Taking Care of Business!! 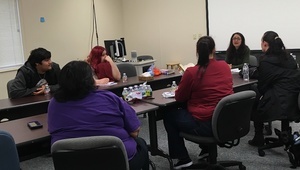 Get Focused Stay Focused Classes! 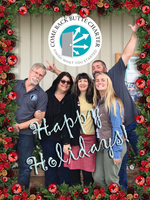 Our Winter Break is from December 25th through January 5th. Be sure to get all of your work done! The semester officially ends on January 12th so use your time wisely. And have fun!! 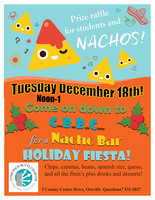 All CBBC students and staff welcome!